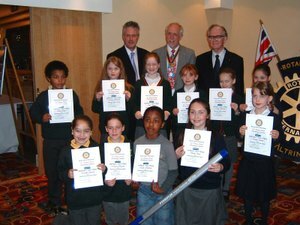 To focus attention on writing, in the Rotary Literacy month of March, the Altrincham Rotary Club, at the suggestion of three local Primary schools, organised a handwriting competition. The Club’s organiser, David Collington, worked closely with the Head Teachers from Broomwood, Cloverlea and Navigation schools, and 400 children eagerly took part in this fun competition. David also secured the sponsorship of the artists materials company, Staedtler UK, which through the helpful cooperation of local manager Graham Harrison, generously donated the prizes of drawing and colouring sets. 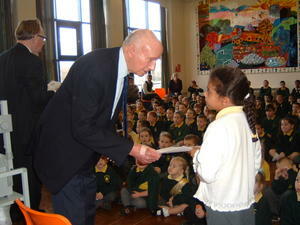 The winners in each school, in years 3,4,5 and 6, were awarded certificates and prizes by the Rotary team after the teachers had made the selections – many hours of extra work for them. The Rotary team then examined these winning entries from each school, and selected the winners in each age-group from across the three schools. Finally, on March 5th, at a special Rotary Meeting at the Cresta Court Hotel. in Altrincham, a grand award ceremony was held, with teachers and parents present, and with Graham Harris presenting the prizes, including book tokens for the 1st placed four winners, and Easter Eggs for all ! It really was a fun night out for all concerned. UKThis competition is a new venture by the Club, and is an addition to its Youth Activities portfolio. The Club believes it is unique in the District if not in RIBI, and is something that other Clubs may wish to try for themselves. The three primary schools in this competition have been most cooperative and enthusiastic. Their teachers were praised for their support and hard work throughout the venture, and Graham Harrison of Staedtler UK was thanked for his company’s participation, sponsorship and generosity with the prizes.